In November 2011 the European Heart Network published its new report on Diet, Physical Activity and Cardiovascular Disease Prevention in Europe. This new report reviews the latest evidence on the relationship between cardiovascular health and what we eat or how active we are. It also takes a close look at current European eating and physical activity patterns and proposes a series of policy actions. In the report on Diet, Physical Activity and Cardiovascular Disease Prevention in Europe, we propose two sets of population goals for European countries to work towards in the medium and long term. The intermediate targets are set at a level which governments could realistically aim for within the next five to ten years. The second, more ambitious goals highlight diet and activity levels to aim towards in the longer term. These goals are not dietary guidelines for individuals. They represent a recommended average intake or level for the population as a whole, and are provided as a tool for policy makers to use in settings and monitoring strategy. The goals need to be translated into meaningful food-based dietary guidelines at the country level, taking local eating habits, activity patterns and cultural factors into account. Please find here a long version of the report, containing all the information and the full text of all reviews. And here a short, summarised version of the report (60 pages) and references for the whole document. 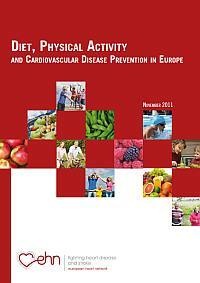 Briefing paper on Diet, Physical Activity and Cardiovascular Disease Prevention in Europe. References for the whole report.